Bassist Ralph Gorodetsky had teamed with Garretson before, as well as thrashing and jazzing in club bands such as Universal Congress Of. Joseph Berardi had played with practically everyone in town, from the Fibonaccis to Stan Ridgway and Rufus Wainwright -- but usually as a percussionist; here he settled behind the vibraphone and the orcoa, a kind of accordion built like a suitcase. Drummer Jason Payne was a former member of the Brit industrial-techno group Nitzer Ebb, a special favorite of Marilyn Manson. Tracy Wannomae had blown woodwinds with poppers Macy Gray and jazzbos Brad Mehldau. These were musicians slavering for challenge, and possessing more than enough cutlery to eat it up. The Sinfonietta brought their Brecht act to the tidy little auditorium of L.A.'s Central Public Library for a couple of 1998 concerts, and the audience, prepared for innocuous family fare, were unmistakably delighted with the casual, full-bodied artfest that the quintet dropped in their laps. Further performances generated a heady buzz in the art community. L.A's. MOCA and Goethe Institute agreed respectively to present and to sponsor a full-on, 360-degree multimedia production of Brecht/Weill's Happy End for 12 performances in 2000, including the precise centennial of Weill's birth, March 2. L.A.'s Happy End ended up stunning capacity crowds with its innovation, wit and pure spectacle. 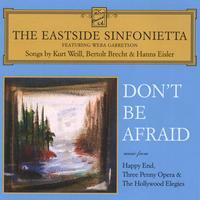 The compact disc that confronts you is a document of the Eastside Sinfonietta's repertoire, drawn from the songs of Brecht, Weill and Hanns Eisler and performed with the Sinfonietta's own brand of emotional if not literal authenticity. Some selections are from Happy End, some not; some are familiar, some less so. You will hear ontological/semiotic/commercial discursions on the subject of rice. You will hear of social malaise, violence and perverted love. And you will perhaps feel that the music of Weimar Germany can seem very modern, and enduringly truthful.